Lens caps…. pain in the arse right? Constantly popping off or falling out of your camera bag… well, the new universal lens cap system from Kuvrd via Kickstarter. Don’t get me wrong, although many of my gear reviews feature many Kickstarter products, I do see some products that question is there really a need for that? …Did I initially think that for Kuvrd’s Universal Lens Cap… yes maybe… could my initial thoughts be wrong?… Potentially! So what is the Kuvrd Universal Lens Cap, although pretty self explanatory, I’ll give you the low down. Kuvrd’s Universal Lens Cap is a new “one size fits all” lens cap that is both water- and dust-proof. It’s made of silicon and can keep all (or most) of your lenses safe. The lens cap will stretch easily to fit the front of lenses that have a diameter from 60mm up to 150mm. The “Lens Cap” will fit both over the front and rear of your lenses, giving that added protection. You can also use this along with your current lens cap, giving that added protection if you so wish. So where do I start with the gear review, firstly I think it’s only fair to point out some of the obvious negatives. Although it’s named a “one size fits all” if you were to use the lens caps with lenses such as the small Nikkor 50mm 1.8 … it’s going to disappear into the Kurvrd design, although it would be fully protected. Personally, I don’t have lenses that small (in actual size) but I would imagine some of the Leica and Fuji lenses may also get swallowed. But from there, it really does fit all lenses, I use the Universal Lens cap on anything from my Sigma Art 35mm 1.4 upto my Nikkor 70-200mm with no problems. Another thing worth mentioning, this system is slower than using the traditional lens caps, of course we’re talking in seconds here, but for some of you, the extra 20 seconds may be an issue. You do have to stretch the Kuvrd Lens caps over the lens, and this can be tricky from time to time, as they’re made to stretch and stay snug and protective over your lens. With the added lens hood, this can be slightly challenging. Finally, if you do use the Kuvrd system without the generic lens cap, you do lose that “hard plastic” protection… but for me that is what a quality camera bag is for. So onto my own benefits and why I have implemented the Kuvrd lens cap into my kit, firstly the system protects my lenses from the elements, I’m talking those awful things like dust, sand, rain and mud…. a photographer's favourite right? You might be saying well doesn’t a standard lens cap do this, well actually no. The generic lens caps only protect the front element, you’re still open to the elements seeping in. A recent example I can give is using the Kuvrd system at a recent wedding…. a very rainy wedding. When using the Universal Lens Cap System, it adds a sense of security you don’t get with the standard lens cap system. You feel safe in the knowledge you can put down a lens with the Universal Lens Cap on both ends and know the rain isn’t going to find its way in. Before the Kuvrd system, I didn’t use lens caps whilst on wedding shoots, to be honest, they just hindered my working, pinging off at every opportunity and felt mega uncomfortable if I had to throw one in my pocket. 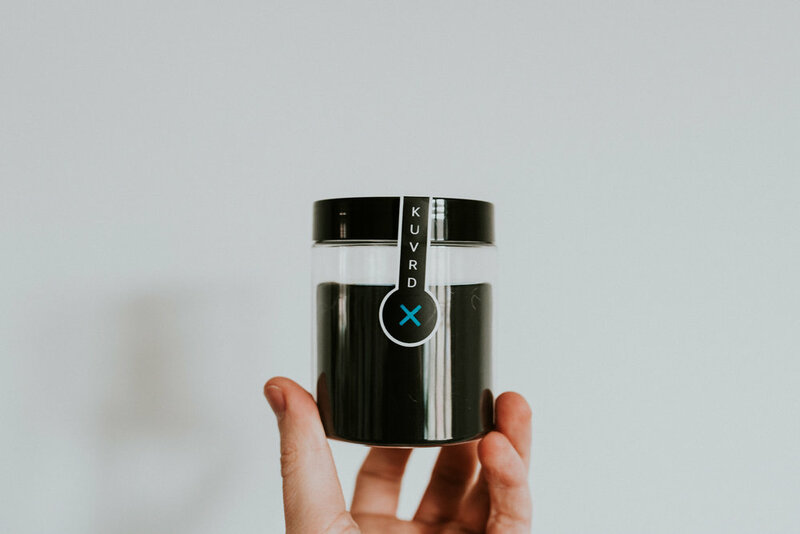 The Kuvrd products, as it’s silicone, can be folded very small and thrown in your kit, plus you don’t need to worry about the correct lens cap for the correct lens.. bonus!! Finally, if you’re shooting in varied weather conditions and find yourself battling humidity or condensation on your lenses.. the Kuvrd systems go some way to aiding those struggles. 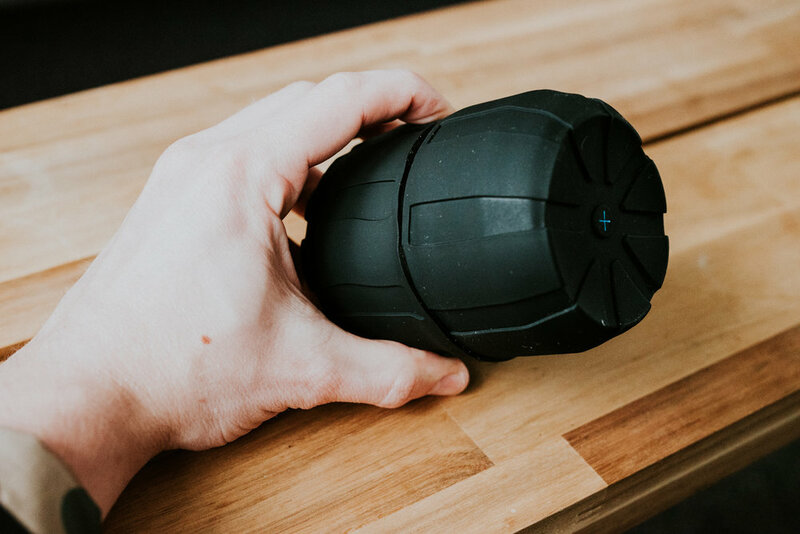 There’s a lot of talks already on the web about how shock absorbing the Kuvrd system is, and with all things that are debated on the web… it’s a 50/50 split. Although I’m dedicated to gear reviews, there was no way I’d be trying those suggestions out. It’s fairly obvious that the system adds some protection than a generic lens cap system would. It’s covering a larger surface area, a lot larger, than the traditional system and it’s also adding a skin of rubber, which of course is going to create some element of added protection. Combine that with the protection from the elements and the universal use… and I think they’re onto a winner. Luke Holroyd became Luke Hlryd this week and here's why! 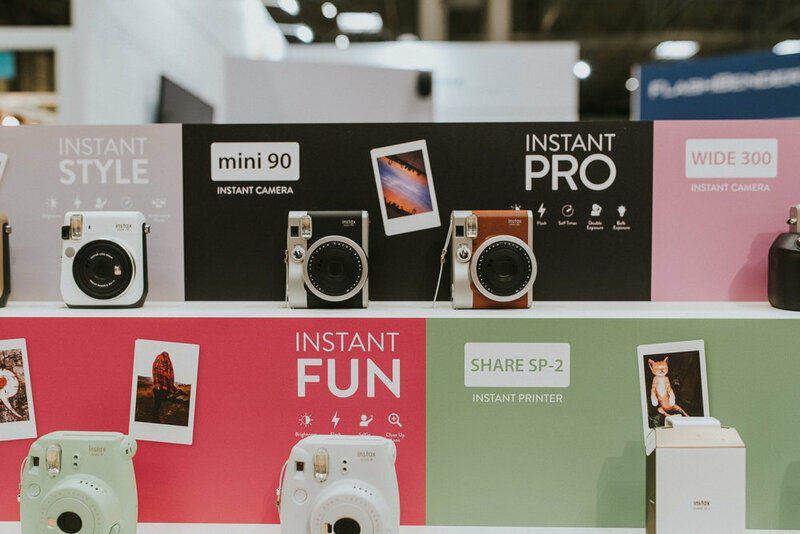 As the Photography Show 2018 draws to a close this Tuesday, I look back at some of the exciting products, live demonstrations and seminars that I found most useful. This year’s show featured over 7 stages that gave advice & demonstrations for the beginners and professional photographers across the four days. One of the fantastic things about the Photography Show is the experience and knowledge available to everyone who walks through the NEC doors, you can be anything from a wildlife photographer to a wedding photographer and there is something for everyone. The ever popular Sigma, again had a fantastic set up at this year's Photography Show 2018, showcasing their new lineup of lenses which sums up their approach to lenses and photography. The three new and popular lines on display were Contemporary, Art and Sports, all of which show Sigma's development philosophy and advanced manufacturing systems. The great thing about the Photography Show is that you can bring along your own camera bodies and try out new kit and the Sigma stand was certainly the place to be for photographers. This wouldn't be a fair review of this year’s Photography Show if I didn't mention the big two names in camera bodies. You may know by now I rarely entertain the Canon vs Nikon debate ( maybe it’s now Canon vs Nikon vs Fuji ? ), so I don’t spend too much time comparing the facts and figures, for me I know they both create some fantastic DSLR cameras and I would highly recommend both to anyone. 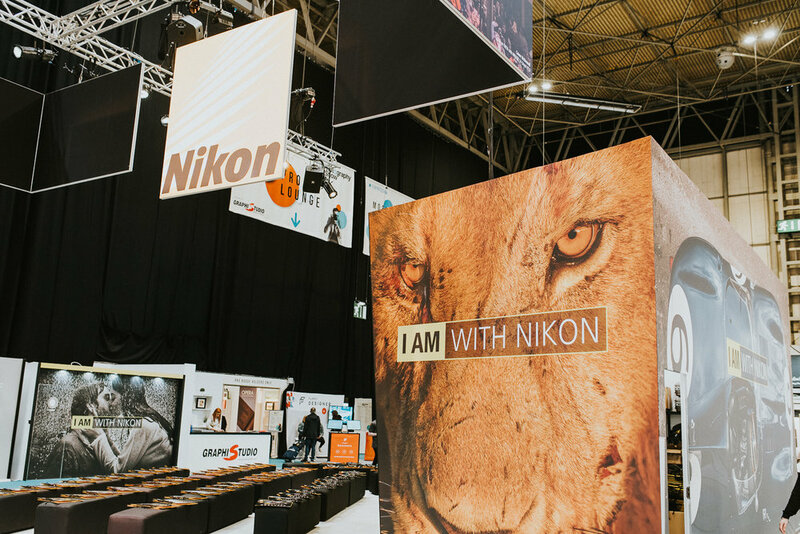 If you’re going to judge the geographical positioning of the two stands Nikon, like Fujifilm, were situated at the entrance to the show with a huge stand to the left of the main entrance. Whilst Canon dominated the back of the whole show and precisely positioned near to the food court to catch people on their way past (to buy a ridiculously over priced burger.. but what do you expect). A big thank you to BIllingham Bags for sending the Billingham Rucksack 25. For anyone who's interested in photography, I can guarantee the majority of you will have heard of Billingham Bags, but the Rucksack range isn't something everyone knows about... but you really should! There are not many photographers I meet that don't already rock a Billingham Camera Bag on their shoulder or plan to invest in one. That's the big thing when it comes to Billingham Bags, investment is the keyword, a camera bag should be a major part of your kit list, for me it's up there as one of my priorities. Without stating the obvious too much, every photographer, in any genre, needs a camera bag that holds all your gear, adds protection and ultimately gives you peace of mind that your equipment is safe. Billingham have been offering these components since 1973, so we can probably be sure they know a thing or two about camera bags & rucksacks. I myself have been rocking a Billingham bag for the last 8/9 years, I bought a second hand bag whilst I was finishing my photography degree in Derby, the thing is over 30 years old and still looks the part and keeps my kit safe! Each bag they produce has over 100 individual components, from the brass buckles and fittings, the genuine leather trims and edging, the soft-weave fabric and waterproof canvas. There's certainly no other camera bag to rival a Billingham on the combination of safety, manufacturing, heritage and style that is still all handmade in the United Kingdom. But that's enough of me, let's drop the Rucksack 25 Review! In the main compartment, the bag features closed cell foam padding on all sides - 2.5cm thick in places - to protect from bumps and impacts. Additionally, inside the main compartment are removable, repositionable padded foam dividers to create places to store spare lenses, light meters etc. Of course, all this foam padding leaves the camera and lenses incredibly protected. Unlike some bags out there the protection doesn't stop with just the padding - the three-layer Stormblock fabric, including a layer of butyl rubber, is impermeable to water. Further, the double zips that grant access to both the main compartment and front pocket are protected by rain guards - the rain guard on the main compartment is adjustable with a drawstring so it can be closed tight over the zip or pulled back to allow ease of access. The outer protection is finished off with four brass feet on the top grain leather bottom corners to minimise wear. Each photographer will have a certain way they pack up their kit, the extra pockets aside from the main camera compartment allow you ample storage and the ability to keep gear separate if you require. Extra storage is provided by a slim document pocket inside the main compartment that's ideal for a map or the tourist leaflets we all get and by the generously sized front pocket - perfect for carrying a newspaper or a raincoat. If that isn't enough AVEA pockets can be attached to strong leather patches on the side.... so the 25 gives me all that extra storage I need. Finally, ergonomically designed shoulder pads and a central backing both made of padded spacer fabric promote breathability and make it easier to carry the bag for long periods. All in all, this will be the perfect medium sized backpack for a great many photographers - use it and you'll see why so many requested they start making it again! Some final thoughts from me and I think it's only fitting that I state the Rucksack 25 has many appeals for many photographers. As I've mentioned many times before in my blog posts, purchasing a Billingham Bag is an investment, and with so many ranges now available via Billingham, you will certainly find one that suits your needs. The Rucksack 25 is perfect for those photographers who find themselves travelling a lot with one Camera setup + lenses. Be it for commuting to work, long weekends away with the camera, a hike or quick photography jobs (pre-wedding shoots, commercial headshots, etc). Another hidden gem of the Rucksack 25, it can be taken on aeroplanes as hand luggage, for any destination wedding photographer like me, having your kit by your side - or in this case in the overhead compartments - is a must when travelling. Just like photography, camera bags aren’t a one size fits all type of product. The one you choose needs to adapt to your needs and make you more efficient as a photographer. So when it comes to different shoots, spontaneous point and shoot expeditions, or weddings with the need for extra lenses and accessories, you’ll want a camera bag that can be customised for these various scenarios. The 25 comes with removable padded inserts allowing you to transform your bag into a casual one at any given moment, so no matter if it's a small mirrorless body or a large dSLR, your kit will remain protected at all times. As with all Billingham bags and accessories you're guaranteed British craftsmanship that boasts quality and durability. For something that looks so beautiful, you think they may be disadvantaged when it comes to the safety of your gear, but everything about these camera bags is sublime. The attention to detail when it comes to the appearance and that unique heritage appeal means the bag will never look out of place and adds a huge advantage over some of the other camera bag companies. The soft-weave fabric which protects the 25 from weather conditions is a must for me, living in the UK means I'm having to deal with bad weather conditions so I want a bag that I can place down knowing it will protect my equipment from the elements. The Stormproof lining and materials ensure whatever job and weather faces you, the gear will be protected and I can guarantee the Rucksack 25 will still look just as good even after the elements. Photographers should be well aware that quality costs money, therefore the price shouldn't come as a surprise. It seems like an obvious statement to make but if you're spending £3000+ on photography gear then a few hundred on a piece of kit that houses it all safety is surely a no-brainer! A Billingham is a camera bag that's going to last decades and will certainly outlive your cameras, you're buying into craftsmanship that has been built to last. Like I mentioned earlier a quality camera bag is an investment, not a purchase. Throw Billingham Bags into an eBay search and you'll see how much these camera bags are valued even when they're second hand. Introducing...Camera Swagg! (Named after the designers' name Swaggart). This is the legendary MoneyMaker in a non-leather material. You asked for it and HoldFast has delivered! You may already be aware and read the blog I did a while back on the really awesome multi camera straps by Hold Fast. 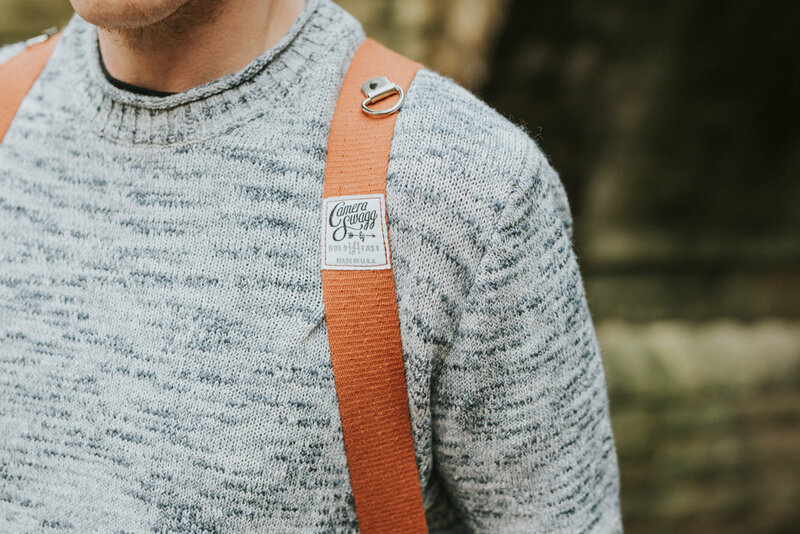 But if you haven't heard of these guys before, they create the awesome MoneyMaker camera straps made from high grade leather and now cotton canvas, complete with metal d-rings, safety straps and a superb versatile design. Most importantly, the straps look the business, keep your cameras secure and feel comfortable even when you're shooting a 12-hour wedding. Camera Swagg is a line of products designed around non-leather materials with a focus on performance and value. You get the same beautiful MoneyMaker design, same hardware, but all made 100% Cotton Canvas, instead of leather. These are one size fits all, and they come with everything you need to shoot with two cameras, including a pair of Camera Holdfasts. This Vegan friendly MoneyMaker means business. High grade Cotton Canvas, anchored metal d-rings, safety straps that connect to the side lug mount, completely bypassing the clip and screw for ultimate security and impeccably versatile design make this an essential tool for the modern photographer. The Hold Fast MoneyMaker allows you to attach any camera and lens with a tripod mount to either side of the harness, what's more, the way the MoneyMaker holds the camera means they hang by your side and keep out of your way. I've spent the lats two years shooting weddings using the leather harness from Hold Fast with two Nikon DSLR's with a 24-70mm lens and a 70-200mm lens with no problems at all. You can walk around freely and the cameras stay tucked into your side and they're ready for you when you need them, you never have to worry about picking up and putting down your cameras when you're on a shoot. Aside from the comfort and ease of using the MoneyMaker it's also very safe, the strap comes with two HoldFast screws that screw straight into your camera or lens tripod mount. Then you simply connect your camera onto your MoneyMaker and use the sailboat clips for extra safety. Seriously, I shot an 11 hour wedding using the MoneyMaker and didn't need to adjust or tighten anything the whole day, it's just perfect! You've probably heard me mention this before but I love honesty, I implement trust and honesty into every aspect of my businesses so it's certainly something I look for when I'm the consumer. The MoneyMaker straps are made of premium cotton canvas and they look and feel durable. I've only field tested the MoneyMaker Cotton Canvas version on a few occasions so I can't say it will last a lifetime but it feels like it would. I've been shooting with my leather MoneyMaker for 2 years now and it still works and looks awesome. But if it doesn't last a lifetime, the guys at Hold Fast give you a lifetime guarantee with every MoneyMaker, they're that confident in their products! Speaking just solely wedding photography for a second, I seriously couldn't shoot a wedding without a MoneyMaker camera strap after using it on a few occasions. I no longer have to worry about leaving my second camera body around and I can easily swap between the two bodies and lenses within seconds. Secondly, it's comfy. In a nutshell I didn't feel like I was carrying two huge Nikon DSLR plus lenses around all day, perfect if you suffer with aches and pains. Thirdly, you would not believe how many wedding guests come up to you and compliment the MoneyMaker, not that I thrive on compliments but it's a fantastic conversation starter. You don't have to worry about keeping your second camera body insight as it's always right by your side. You look the business and it's a great conversation starter. Comfortable to wear all day. Easily swap between camera bodies and lenses. Be prepared to spend a little for a great investment and product. Your MoneyMaker has a lifetime guarantee so there's no need to worry - not that it will ever break! Where to buy: B&H have a huge stock of MoneyMakers, follow the link to have a look. For UK Photographers head over to Rigu.co.uk for a huge range.